Best Pizza In Milan, Milan Restaurants, Piz Milan MIlano Pizza Go TODAY! 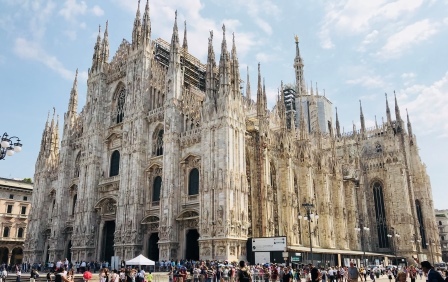 When you think of Milan your thoughts immediately turn to fashion and Haute couture, a city full of “the beautiful people” dressed immaculately as they go about their daily lives. Maybe you think of Leonardo da Vinci the incredible painter, sculptor, architect, designer and visionary who was born in the 15th century, visit Milan and you certainly can’t escape him! Or if sport is more your thing, what the 2 great footballing teams of Inter and AC Milan who content fierce local rivalries? Maybe food and pizza is your thing? Whatever you like to do, Milan has more than most cities to keep you entertained! 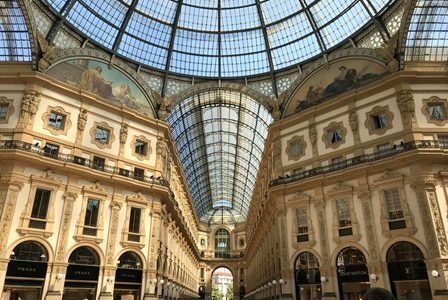 Milan Tourist Attractions – Not Forgetting Pizza! 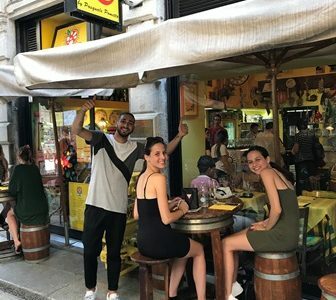 On a recent city break we wanted to find out what is regarded as the best pizza in Milan, so we consulted Google and found many recommendations, cross checking the suggestions on TripAdvisor one name kept coming up over and over again – Piz Milan. We’ll come back to this later. As well as enjoying the gastronomic delights Milan has to offer, plan your stay to take in as much of the city as you can, the incredible cathedral or known locally as Duomo di Milano found on one edge of piazza del Duomo, the incredible shopping space known as Galleria Vittorio Emanuele II where you can window shop the very best in world fashion while enjoying a prosecco or gelato! A must visit is the Santa Maria delle Grazie which holds quite possible one of the most famous paintings known – The Last Supper. We’ll talk more of pizza in a second but other famous dishes include Risotto Milanese, soft golden rice given an amazing colour with the use of saffron, Ossobuco, classic veal shin serves with risotto or polenta, Milanese-Style Minestrone, Meat-Filled Milanese Ravioli, Cassoeula, Milanese Tripe Soup Busecca and the classic light Chritmassy cake/loaf – Panettone. But what about Pizza? According to www.wheremilan.com/local-culture/pizza-styles-milan/ Pizza in Milan is usually considered to have 6 main different styles according to texture, shape, and crust: the Neapolitan style, the Roman style, the No Yeast Pizza, the Slice Pizza, the Gourmet pizza, and the Fried one. However, you might get confused while leafing through a menu as some pizzas are also called napoli (Naples) and romana (Roman). The “queen” of all pizzas is the margherita (tomato sauce, mozzarella, basil, extra virgin olive oil). A more expensive variation of this pizza is the bufala (buffalo mozzarella, tomato sauce or cherry tomatoes, basil, extra virgin olive oil). Marinara is the most simple one (tomato sauce, oregano, garlic, extra virgin olive oil), while the napoli comes with tomato sauce, oregano, anchovies, capers, mozzarella, and extra virgin olive oil, and the romana is a napoli without capers. 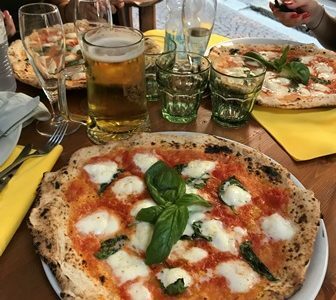 So onto the pizza restaurant known as Piz or Piz Milano, currently rated as TripAdvisor’s top Milan pizza place with a score 4.5 out of 5 from 3,422 reviews, pretty impressive! It’s a wacky, quirky almost art deco kind of place where the service is first class! We were lucky and got in straight away, but even with very little wait we were treated to free prosecco and cheesy flat bread to whet our appetites. The manager was full of enthusiasm and the waiting staff were very attentive, talking us through a not very exhaustive menu choice of 3 pizzas. I like this, the sort of place that has total confidence in its food, so much so that if you don’t like it they are quite happy for you to go somewhere else! 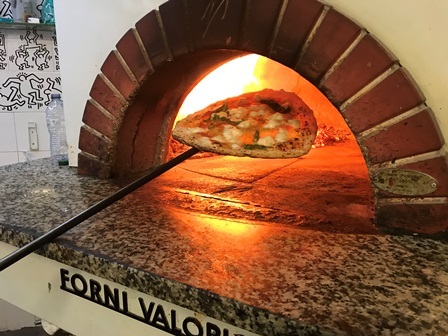 The pizzas as you can see are simple, but amazing and the crusts taste amazing thanks to the wood fired pizza oven, a well-worn and well-loved oven from Valoriani. The oven was on and cooking pizzas in minutes, giving the crusts an amazing flavour. 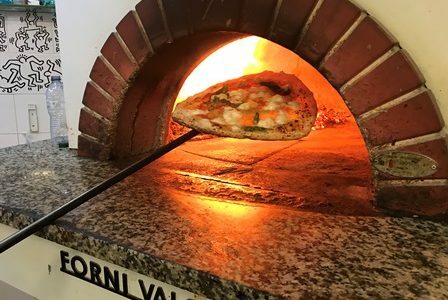 It was easy to see the benefits of a wood burning pizza oven, especially when you see it in action like this! I was allowed to get close up and have the pleasure of seeing a freshly cooked pizza get taken out, at that point my mouth started salivating all over again. If you’re in Milan, you have to try out Piz, it’s really quite close to the Duomo as you can see from the map, you want be disappointed with the pizza, not surprising really as Valoriani is the name on front of the oven!